With the sweltering heat today, I wanted something salad-like but more filling than a salad. 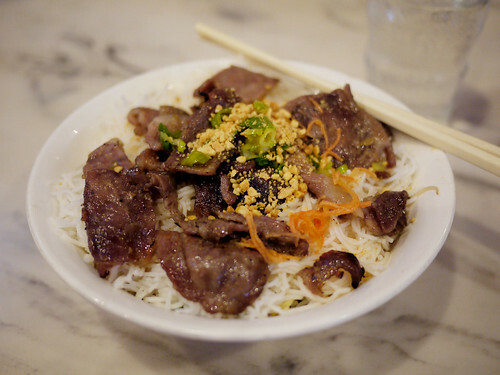 Vietnamese 'bun' (rice vermicelli) dishes fit the bill pretty perfectly. Under the meat or topping of your choice and the vermicelli is a mountd of lettuce, some cucumber and herbs. All this to be lightly tossed with the accompanying nuoc cham. Filling and refreshing. And while Pho Bang may not have the best bun thit heo nuong, its convenient location won out from seeking better.